Victoria’s solar feed-in tariff is set to shift to a time-varying model, after the details of the of the new scheme – an Australian first – were finalised by Victoria’s Essential Services Commission. 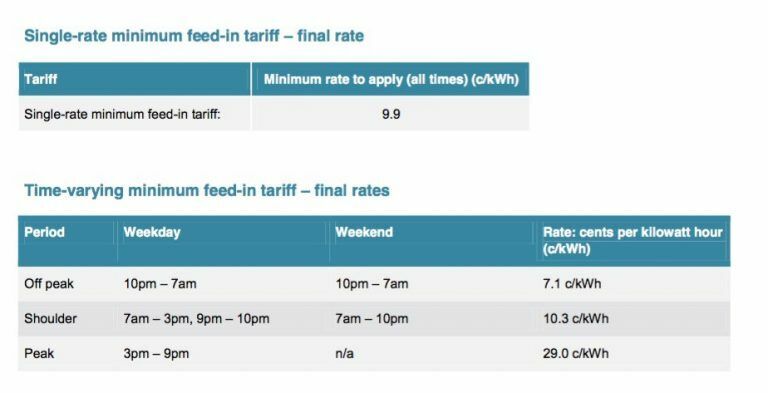 The new solar FiT, to be introduced in July 1, 2018, will require retailers to pay a minimum 29c/kWh for exports between 3pm and 9pm, a minimum of 10.3c/kWh for between 7am and 3pm, and a minimum of 7.1c/kWh (down from 7.2c) in the unlikely event anyone is exporting between 10pm and 7am. The tariffs will be voluntary for retailers for just one year, and ultimately become compulsory. Although the ESC suggested it may consider an extension in the face of objections. In the meantime, an alternative flat rate of just 9.9c/kWh can be paid for the next year. That price has been criticised by solar advocates as being much lower – down 1.4c/kWh – than the previous flat rate, at a time when wholesale prices have jumped. But the retailers argued it was too high. The ESC hopes the time varying tariffs will encourage households to either shift their load (such as pool pumps), orientate their panels to the west, rather than the north (to produce more later in the day), or to install battery storage. The ESC is also looking at imposing “critical peak tariffs”, which will result in even higher payments when wholesale prices jump above $300/MWh and surge to the market cap ($14,200/MWh, or 142c/kWh). The Victoria tariff is also the only state-based FiT that explicitly includes a “social cost” of carbon, 2.5c/kWh.